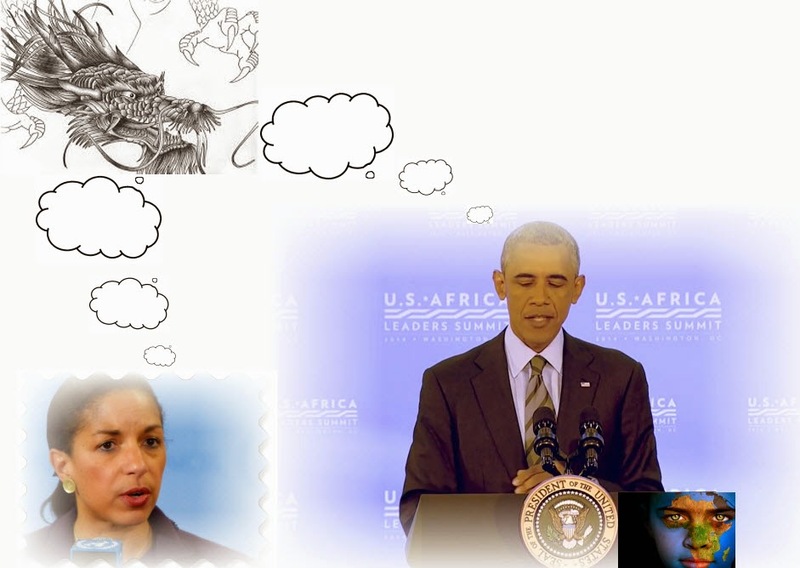 Last week saw the U.S.-Africa Leaders Summit 2014 in Washington , D.C. "... President Obama welcomed leaders from across the African continent to the nation’s capital for a three-day U.S.-Africa Leaders Summit, the first such event of its kind. 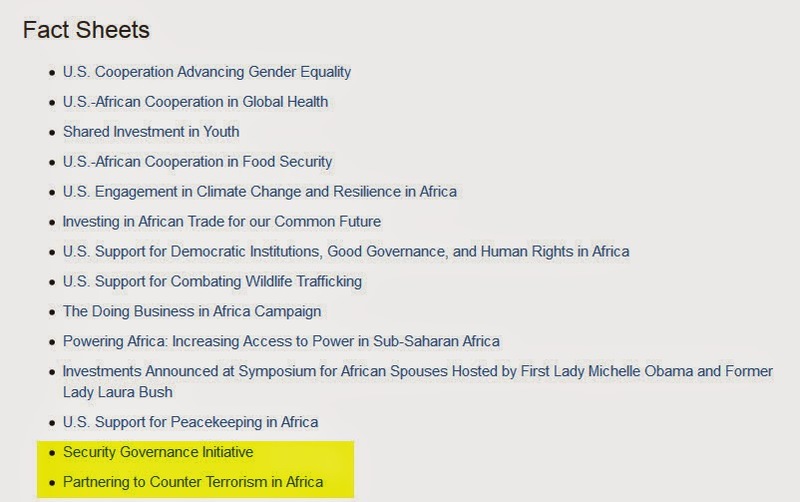 The Summit, the largest event any U.S. President has held with African heads of state and government, built on the President’s trip to Africa in the summer of 2013 and aimed to strengthen ties between the United States and one of the world’s most dynamic and fastest-growing regions..."
Well, after six years in office, President Obama finally turns his attention to Africa... The continent had been energized and expected big things when President Obama, son of a Kenyan economist, was elected and sworn into office, only to find themselves relegated to the back-burner. Perhaps better late than never! First up, National Security Adviser Susan Rice, who opined: "Typically, the nature of China's engagement is it brings in thousands of Chinese workers and uses Chinese to build roads, build buildings, rather than giving jobs and opportunity and capacity building for Africans which is a real distinction between the American approach and the Chinese approach. The American approach is not to bring in a bunch of foreigners to take jobs from Africa, but it's actually to build African capacity." "... The fact is that the United States builds very little in China. So there's no way of making a very meaningful, direct comparison between the American way of doing business and civil engineering or construction and the way that China does business in this sector. However, one can say that until recently when Congress changed the law to change the eligibility to bar Chinese companies, the United States was spending lots of money to pay for Chinese companies to do contract work on its behalf in Africa... You know, the United States just a few years ago spent $230 million to pay a Chinese company called Sinohydro to build an irrigation and waterworks system for an American project. The United States spent $71 million for the expansion of the Bamako airport, giving those funds to the same Chinese contractor, Sinohydro. And the problem was that American companies, as I was told by U.S. diplomats, couldn't be interested in this kind of contract work..."
Next up, President Obama : From Obama suggests US is better partner than China to African leaders: "... President Obama took a swipe at China in a speech to a summit of African leaders in Washington on Tuesday, claiming that the US is interested in the continent for more than just its minerals and oil. “We don’t look to Africa simply for its natural resources. We recognise Africa for its greatest resource which is its people and its talents and its potential,” he told the largest gathering of African leaders ever held in Washington. “We don’t simply want to extract minerals from the ground for our growth. We want to build partnerships that create jobs and opportunity for all our peoples, that unleash the next era of African growth,” Although the president did not mention China by name, the comments were clearly aimed at Beijing as his administration uses the summit to promote the US as a better partner in its efforts to catch up with the rapidly expanding Sino-Africa trade..."
Quite apart from the gratuitous swipe at China, what exactly does U.S. trade with Africa consist of? Well from the Office of the United States Trade Representative mostly imports of raw materials and exports of more value-added, 'finished' products (as would be pretty typical of trade with a less-developed country). Exports: "U.S. goods exports to sub-Saharan Africa in 2013 were $24 billion, up 6.9% ($1.5 billion) from 2012, and up 250% from 2003. U.S. goods exports to sub-Saharan Africa accounted for 1.5% of total U.S. goods exports in 2013. 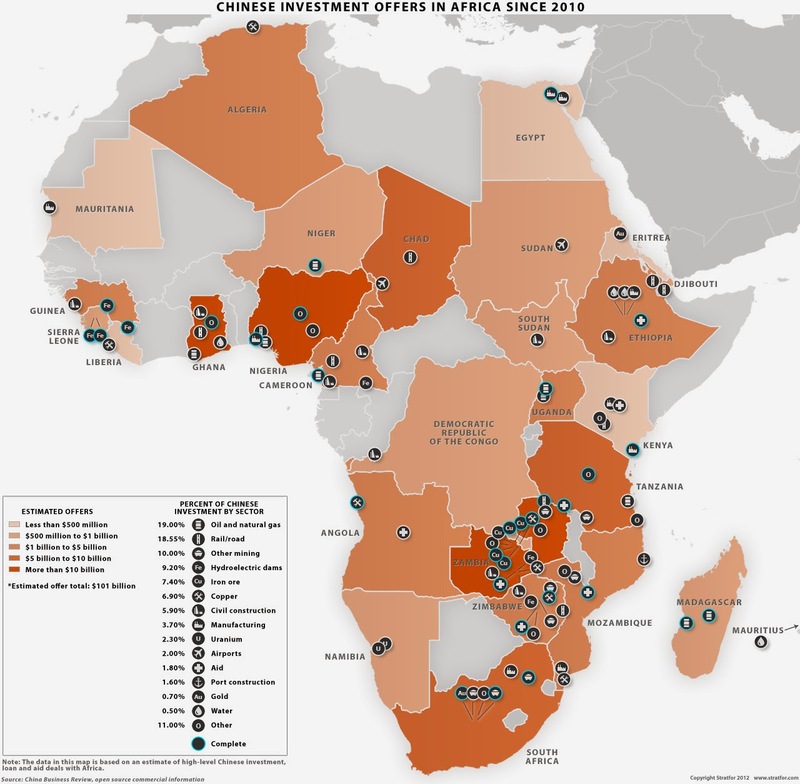 Roughly 30% of U.S. exports to sub-Saharan Africa went to South Africa in 2013. The top U.S. export markets in sub-Saharan Africa for 2013 were: South Africa ($7.3 billion), Nigeria ($6.5 billion), Angola ($1.5 billion), Ghana ($1.1 billion), and Togo ($956 million). The top export categories (2-digit HS) in 2013 were: Machinery ($4.9 billion), Vehicles ($3.6 billion), Mineral Fuel (oil) ($3.5 billion), Aircraft ($1.3 billion), and Cereals (wheat and rice) ($1.3 billion)." Imports: "U.S. goods imports from sub-Saharan Africa totaled $39.3 billion in 2013, a 20.8% decrease ($10.3 billion) from 2012, but up 53% from 2003. 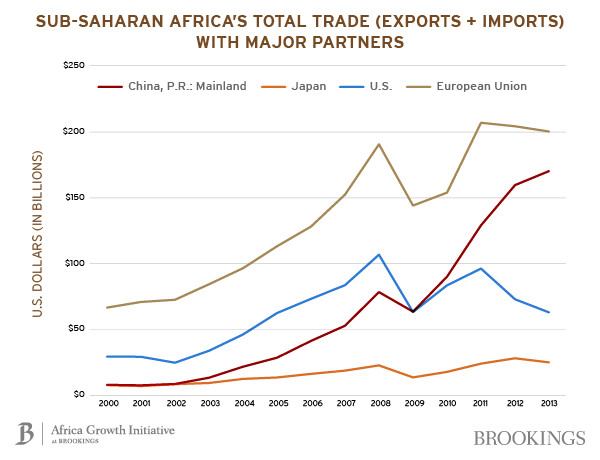 U.S. imports from sub-Saharan Africa accounted for 1.7% of total goods imports in 2013. Approximately 30% of U.S. imports from sub-Saharan Africa were from Nigeria and 22% from Angola. The top U.S. import suppliers from sub-Saharan Africa for 2013 were: Nigeria ($11.7 billion), Angola ($8.7 billion), South Africa ($8.5 billion), Chad ($2.5 billion), and Congo ($1.2 billion). The five largest import categories in 2013 were: Mineral Fuel (crude) ($26.3 billion), Precious Stones (platinum and diamonds) ($3.2 billion), Vehicles ($2.3 billion), Cocoa ($1.0 billion), and Ores, Slag, Ash (titanium, chromium, and uranium) ($968 million)..."